Nolita vegetarian cafe The Butcher's Daughter has expanded to a third location in New York City, at 271 Metropolitan Ave. in Williamsburg. 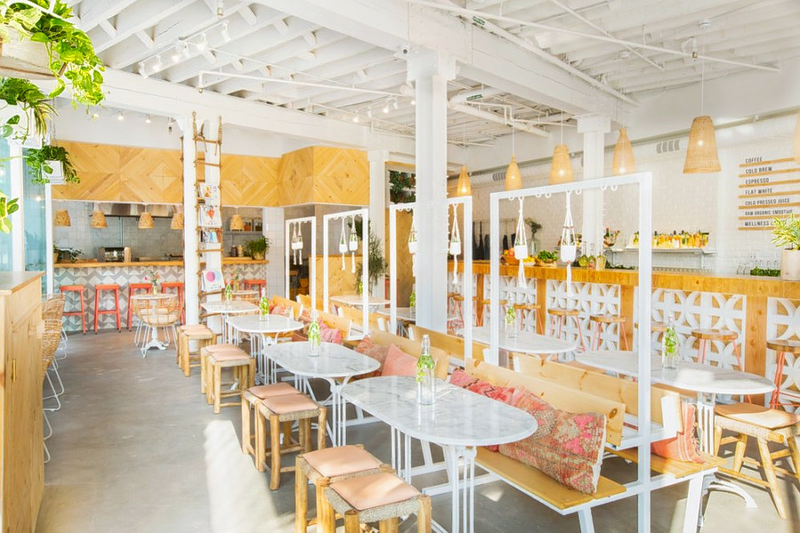 The new outpost, open for breakfast and lunch only, specializes in juices, smoothies, and plant-based versions of classic brunch dishes. On the menu, you'll find smoothies like the Pink Waterfall (strawberries, raspberries, coconut yogurt, pomegranate powder), juices like the Water Flower (watermelon, fennel, honeydew, cactus pear, lime, lavender and agave) and breakfast fare like the smashed avocado toast with curry and cilantro. With a four-star rating out of nine reviews on Yelp so far, the newcomer has gotten a positive reception in its early days. "Beautiful vibe, delicious food, and a multitude of fun drinks to try! The fresh cut grass shot was true to its name," wrote Yelper Caroline M.
And Yelper Wilson G., who reviewed the new spot on July 28, wrote, "You can tell a lot of thought goes into their food options. Our server was also really accommodating for my girlfriend who has a nut allergy, he showed her which items would be best and even made a point to check when the food arrived." Head on over to check it out: The Butcher's Daughter is open from 8 a.m.-4 p.m. daily.